We are delighted that three MAITS volunteers have been awarded the Prime Minister’s Point of Light Award for their work with us! Janet Ivin, John Carter and Geraldine O’Grady were three of only six people who received this award for their outstanding volunteer work for those with special educational needs and disabilities. The Prime Minister’s daily Points of Light award recognises outstanding individual volunteers – people who are making positive changes in their communities and around the world, with recognition of these individuals being based on how their “actions have changed lives and how their stories can inspire thousands more to get involved or start their own initiatives”. These volunteers have been specially recognised to coincide with the first ever Global Disability Summit, co-hosted by the UK’s Department for International Development with the International Disability Alliance and the Government of Kenya which took place on the 24th July at the Queen Elizabeth Olympic Park in London. The summit brought together leaders from the private sector, governments, donor agencies and charities to raise awareness and show a commitment to transform the lives of people with disabilities. Geraldine, John and Janet were invited to Whitehall for a round table meeting with Lord Michael Bates, the Minister of State, along with the three other winners, where they were presented with a certificate and a signed letter from the Prime Minister. During this meeting they were invited to speak about their voluntary work and had the chance to discuss why they view volunteering as important and how it can be expanded to have a further lasting impact. Janet and John received the award for their dedication and voluntary work training occupational therapists, physiotherapists and special needs teachers to make low-cost, therapy and rehabilitation equipment for children with disabilities out of paper and cardboard. This pioneering ‘Appropriate Paper-Based Technology’ (APT) is environmentally friendly and allows equipment such as specialised supportive chairs for children with cerebral palsy to be made to individual specifications from everyday items such as cardboard, newspaper and plastic bottles. MAITS would like to take this opportunity to congratulate all of the winners of this prestigious award and also to acknowledge all the MAITS volunteers, without whom MAITS would not have been able to reach all the people we have. 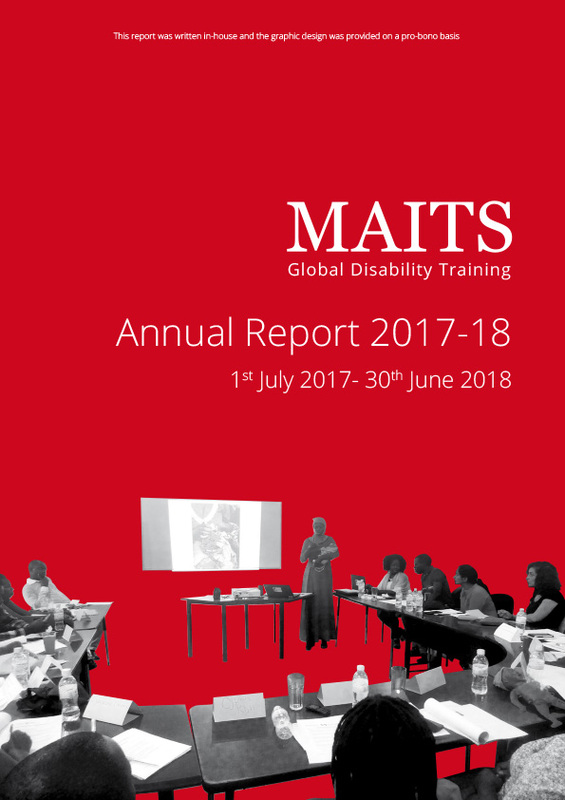 We are inspired by and grateful to every single person who has volunteered their time with MAITS to help and support people with disabilities in developing countries. MAITS CEO Esther Hamilton says “It is an inspiration to work for a charity, in which people come together and volunteer their time to improve the lives of those with disabilities and we thank you all. Feel like you would like to get involved and make a difference? MAITS is currently accepting applications for small grants to enable experienced disability professionals from all over the world to share their skills with those working with and caring for those with disabilities in low and middle-income countries. If you are an organisation in a developing country looking for training, we are always keen to hear from you. Both trainers and organisations receiving training can register with us and apply for small grants to cover costs that make the training possible.